Physician. Bishop of Sebaste, Armenia. Lived in a cave on Mount Argeus. Healer of men and animals; according to legend, sick animals would come to him on their own for help, but would never disturb him at prayer. Agricola, governor of Cappadocia, came to Sebaste to persecute Christians. His huntsmen went into the forests of Argeus to find wild animals for the arena games, and found many waiting outside Blaise's cave. Discovered in prayer, Blaise was arrested, and Agricola tried to get him to recant his faith. While in prison, Blaise ministered to and healed fellow prisoners, including saving a child who was choking on a fish bone; this led to the blessing of throats on Blaise's feast day. At the age of sixteen months, Marie broke her hip in a fall that left her crippled. Her mother, refusing to give up, carried the child to a local Pieta statue each day to pray. On 8 September 1774, having seen her mother spend hours in prayer, Marie was suddenly able to walk. However, the effects of her early immobility, and the rickets she suffered, stayed with her, and even as an adult she stood only four foot, four inches tall. At age seventeen Marie tried to join the Sisters of Notre Dame, but was refused due to her poor health, and returned to her parents' home. By age eighteen Marie was devoting herself to evangelization and care for the poor in her home parish. She started her own school in 1786, a place that welcomed the well-off and the impoverished. When the French Revolution began in 1789, and religious expression was suppressed, Marie held covert Sunday prayer services when there was no priest available to celebrate Mass. In 1794 the government confiscated the Dominican house her school had been using, sold it, and kicked out Marie and her teachers. As they left, the convent's statue of the Virgin Mary smiled at them and moved; the little group took it as a sign, and decided to stay together. When all other convents were being closed, Marie and four like-minded friends opened a new one on 21 November 1796 near Thueyts, Ardeche, France. They became the foundation of the Sisters of the Presentation of Mary (White Ladies). The Sisters devoted themselves to teaching and home evangelization, care for orphans and the abandoned, bringing Jesus to anyone who would listen, and in their words "to pass on hope". By the time of Marie's death, there were 350 Sisters and 114 houses; today there are over 3,000 Sisters working in France, Switzerland, Canada, United States, England, Spain, Italy, Portugal, Mozambique, Japan, Philippines, Senegal-Gambia, Ireland, Peru, Brazil, Cameroon, and Ecuador. Born to the French nobility. Benedictine monk at Old Corbie Abbey in Picardy (in modern France) and New Corbie in Westphalia (in modern Germany). Studied under Saint Adelard of Corbie and Saint Paschasius Radbert. Accompanied the converted King Harold to Denmark when the exiled king returned home. Missionary to Denmark and Sweden. 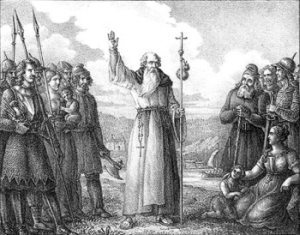 Founded first Christian church in Sweden c.832. Abbot of New Corbie c.834. Archbishop of Hamburg, Germany, ordained by Pope Gregory IV. Papal legate to the Scandanavian countries. Established the first Christian school in Denmark, but was run out by pagans, and the school was burned to the ground. Campaigned against slavery. Archbishop of Bremen, Germany. Converted Erik, King of Jutland. Great preacher, a miracle worker, and greatly devoted to the poor and sick. Sadly, after his death most of his gains for the Church in the north were lost to resurgent paganism. Studied for the priesthood at Douai, France, beginning at age 39. Ordained at Binche, Hainault (in modern Belgium) on 11 June 1576. Two of his four brothers followed him into the priesthood. John returned to England on 7 November 1576 as a missioner to London. Joined the Jesuits at some point; though the date has been lost it was probably close to the time of his arrest. In November 1577, he performed an exorcism on one of his parishioners; during the ceremony, the person predicted Father John's impending doom. A week later, in the evening of 1 December 1577, John was arrested while at prayers, charged with Catholicism. On 30 January 1578 he managed to celebrate Mass in Newgate prison, apparently with materials that had been smuggled in. Condemned on 1 February 1578 for the treason of Catholic priesthood and refusal to acknowledge the Queen's supremacy in spiritual matters; he was thrown into the pit of the Tower of London for two days, and then excuted. His dying words were "I forgive the queen and all the authors of my death." Born to a family of wealthy land owners in feudal Japan. After learning of Christianity from Jesuit missionaries, he converted at age 12. Married, layman, and a samurai. When Shogun Toyotomi Hideyoshi banned Christianity, Takayama refused to give up his faith, lost all his lands, assets, rank and power, and was exiled to the Philippines in 1614 when all Christians were ordered deported. Takayama chose his faith over his career, his position and his wealth. Though he died of natural causes, because he contracted the fatal illness due to choosing his faith over the world, he is considered a martyr. Raised in a pious family. Two of her brothers were murdered in the excesses of the French Revolution; they went to their deaths forgiving their killers and asking Claudine to do the same. Claudine worked with working class young women around Lyon, France. In 1816, with Father André Coindre, she formed a group that would become the Religious of Jesus and Mary (Sisters of Jesus-Marie) at Lyon in 1818, a teaching order dedicated to educating poor girls. Taking the name Mary of Saint Ignatius, she served as superior of the Sisters. The Order received papal approval from Pope Blessed Pius IX on 31 December 1847, and today runs boarding schools, colleges, and retreat houses in Europe, India and North America. Fled from Syria with 300 Catholic companions to Italy due to Monophysite persecution of Severus in 514. Ordained in Rome, Italy. Preacher in Umbria, Italy. Founded a monastery at Spoleto, Italy. Bishop of Spoleto for 20 years. When he arrived to assume his see, the people rejected him as a foreigner, but the city gates miraculously opened on their own to let him in, and the people realized that God wanted him there. He later resigned to found the abbey of Farfa in the Sabine hills near Rome. A renowned peacemaker, Lawrence had the gift of healing blindness, both physical and spiritual, which led to the title Illuminator. Born to the nobility. Benedictine monk. Spiritual student of Saint Remaclus. Worked with Remaclus at Solignac, at Maastricht, Netherlands, and at Stavelot, Belgium. Priest, ordained at by Saint Remaclus. With the assistance of Remaclus and Pepin of Heristal, he founded the Chelles Abbey, diocese of Liege, Belgium. Spent his later years as a hermit near Dinant on the Meuse. Professed nun in the Sisters-Servants of the Holy Spirit of Perpetual Adoration. Worked with Saint Arnold Janssen. Co-founder of the Sisters-Servants of the Holy Spirit. Jewish, the daughter of Phanuel, tribe of Aser. Married at age fourteen; widowed at twenty-one. 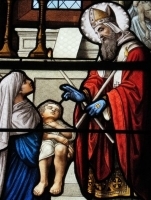 At age 72 she was charged with the care of the Blessed Virgin Mary at the Temple from her presentation there at age three until her betrothal to Saint Joseph. She was in attendance at the Temple when Jesus was presented. Having all her life believed in the prophecies of the Old Testament, she was the only woman in the Temple to greet Jesus. One of six childen born to Johann Andritzki Kantor, a school teacher, and Magdalena Andritzki. Ordained on 30 July 1939 in the diocese of Dresden-Meissen, Germany. Arrested by the Gestapo for producing Christmas plays which were described as having "hostile statements" against the Nazi regime. Died in the Dachau concentration camp. Martyr. Born to an English mother and Hungarian father. Relative of Saint Thomas of Canterbury. Her mother died while the two were on a lengthy pilgrimage in the holy lands. Margaret then made solo pilgrimages to Montserrat in Spanish Catalonia, and Puy, France. Benedictine Cistercian nun at Sauve-Benite, diocese of Le Puy-en-Velay, France. Born to the nobility, the daughter of Odolard, Duke of Lothringia and Nona, and the niece of Saint Amand of Maastricht. Odolard developed leprosy; when Berlindis would not drink from the same glass as her father, the duke disowned her. Benedictine nun at Saint Mary's convent, Moorsel, Belgium. Anchoress at Meerbeke, Belgium. Nephew of Saint Laurentinus, Saint Laurentius, and Saint Clerina. Imprisoned and tortured during the persecutions of Decius in Rome, Italy. He was eventually freed and returned home to Carthage. Ordained as a deacon by Saint Cyprian. Because he suffered so much, and because he was willing to die for the faith, he has always been listed as a martyr. Born a princess, the daughter of King Wulfhere of Mercia and his queen, Saint Ermenilda. Nun. Spiritual student of Saint Etheldreda. Worked for reform in female religious houses throughout England. Reported to read minds. Third century shepherd in the area of Armentarius, Cappadocia (an area of modern Turkey) whose reputation for piety led to his arrest and extensive torture during a persecution of Christians in the area. He survived it, and died years later, his example having brought many to the faith. Legend says that at his death, his shepherd's staff put out roots, branched out, and later bloomed. Sister of Saint Ercus (Euny). Spiritual student of Saint Baricus. Missionary to Cornwall with Saint Fingar, Saint Piala and as many as 777 companions. Legend says that to reach Cornwall, she sailed across the Irish Sea on a leaf. Saint Ives, Cornwall is named for her. Martyr. Bishop of Vienne, France in 581. Actively involved in the 1st Council of Mâcon in 581, the 2nd Council of Lyon in 582, the 2nd Council of Mâcon in 584 and the 2nd Council of Valence in 584. Married to Ceolred of Mercia. Widow. Nun and then abbess at Bardney, England. Court singer and troubadour. Convert. Benedictine Cistercian monk at Froidmont, France. 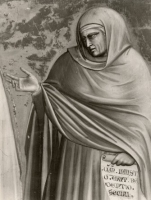 Brother of Saint Laurentius and Saint Clerina. Uncle of Saint Celerinus. Martyred in the persecutions of Decius. Brother of Saint Laurentinus and Saint Clerina. Uncle of Saint Celerinus. Martyred in the persecutions of Decius. Brother of Saint Laurentinus and Saint Laurentius. Aunt of Saint Celerinus. Martyred in the persecutions of Decius. Bishop of Csanád, Hungary. Pauline monk. Prior of the house at Diósgyor (modern Miskolc), Hungary. Bishop in Scotland. Pilgrim to Rome, Italy. He abandoned his see to live as a hermit at Salins, France. Priest. Spiritual student of Saint Hilary. Bishop of Oreto, Spain. Martyred in the persecutions of Nero. Uncle of Saint Celerinus. Martyr. Saint Cyprian wrote about him. Benedictine monk at Santa Maria di Portonuovo at Ancona, Italy. Martyred in Africa. No further information has survived. A church in Roscommon, Ireland is named in her honor. Bishop of Vienne, France during a period of great political turmoil and rampant heresy. Bishop in Jutland, Denmark. Martyred by local pagans. Sixth century bishop of Gap, France. Eighth century monk at Lagny, France. Bishop of Lyon, France in 486. A collective memorial of all members of the Benedictine Order who have died as martyrs for the faith.